The Structural Transformation of African Agriculture and Rural Spaces (STAARS) project is a collaborative venture between the African Development Bank (AFDB), CGIAR Research Program on Policies Institutions and Markets (PIM), Partnership for Economic Policy (PEP), African Economic Research Consortium (AERC), World Bank, and Cornell University. 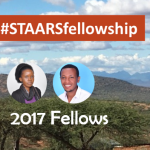 Its offspring and an integral part, the STAARS fellowship program began in 2016 and to date has supported 14 talented early-career African researchers from Benin, Democratic Republic of Congo, Ghana, Ethiopia, Kenya, and Malawi. STAARS fellows, selected through a competitive process, are paired with faculty and research staff at Cornell University, with whom they jointly author a paper on a topic of mutual interest relating to structural transformation in Africa south of the Sahara. STAARS fellows’ research uses high-quality panel datasets, such as the World Bank LSMS-ISA data. In addition to producing high-quality publishable research, the STAARS fellowship includes writing, data management, and communication capacity building. Want to become a STAARS Fellow in 2019? CLICK HERE! 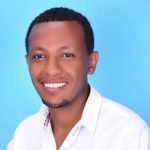 We talked with two 2017 fellows, Wondimagegn Mesfin Tesfaye and Chiyembekezo Chafuwa, to learn more about their STAARS experience. Why did you decide to participate in the STAARS fellowship program? The STAARS fellowship program was designed for highly motivated talented early-career African scholars. I felt that participating in this fellowship would be an excellent way to become part of a great network of other fellows and researchers and to expand my professional reach. And since I have a keen interest in research areas related to the structural transformation of African agriculture, decision to apply for the STAARS fellowship program came very naturally. Was it difficult to apply? The process itself was not difficult. Of course, to be competitive in the selection, applicants need to develop good quality research proposals. The rest is clearly explained in the application guidelines. What was you brightest impression, most exciting moment in the program? Three weeks that I spent at Cornell University working side by side and communicating with seasoned researchers were a real highlight of the program. They boosted my motivation to develop new scientific goals and overcome challenges. I was also greatly impressed by the data management training, it really improved my data management skills. How has the fellowship helped or will help you in your research and professional development? During the program we were paired with mentors who provided us technical and intellectual support. As a STAARS fellow, I had the chance to meet and interact with researchers and people from different organizations. This not only helped me to establish links with other researchers and scientific organizations that I would not be able to link with otherwise, it also paved the way for future research collaborations. What would you wish to this year’s applicants? The STAARS fellowship attracts highly motivated and talented young researchers with a keen interest in the structural transformation of African agriculture and rural development. The fellowship is an excellent opportunity to propel your research work, create new collaborations, and widen your professional reach. I wholeheartedly encourage interested young researchers to apply for the STAARS fellowship program. The STAARS program provides an exceptional opportunity to promote up-and-coming African researchers like myself, and to build our capacity to produce quality and relevant research outputs. The fellowship program also encourages analysis using large datasets like the LSMS-ISA data, which I have a lot of interest in. I believe these datasets are rich and provide a very broad scope for agricultural research in Malawi and Africa in general. The intensive mentorship and guidance by Cornell faculty members is one of the best and most unique elements of the STAARS fellowship program. Fellows learn so much by interacting with their mentors! In addition, events such as the STAARS Conference provide a good platform for fellows to showcase and get valuable feedback on their work, and also to learn from the work of seasoned researchers from around the world. How has the fellowship helped you in your research and professional development so far? The fellowship has helped me tremendously in my research and professional development. It has helped me refine my research idea and define it better than I did before. My mentors helped me to properly shape the research question and design a suitable methodology to capture it. Further, hands-on data management and software trainings have really been relevant in my work. Your recommendation to this year’s fellows? I would recommend that fellows try to learn as much as possible during their visit to Cornell, and throughout the fellowship. Networking is also important. Terrific! I just got to know about STAARS this night through CGIAR What's New in Research which i subscribed to. It's a good initiative especially those of us with keen interest in developing our research skills and also CoP is paramount. Thank you! 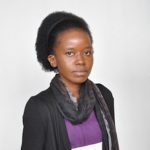 We hope these stories inspire more young African researchers to apply for the STAARS fellowship! This is very interesting,thank you so much please.